President Kev Kluver and the Directors of the Sherwood Australian Football Club cordially invites you to attend the club on the evening of 18th June to celebrate the club's 60 years of operation. 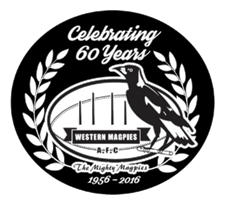 One thing has not changed over the last 60 years and that is the members, players and supporters of the Sherwood Football Club and the Western Magpies are enthusiastic and a dedicated group of people who have influenced the lives of countless young people over the last 60 years. 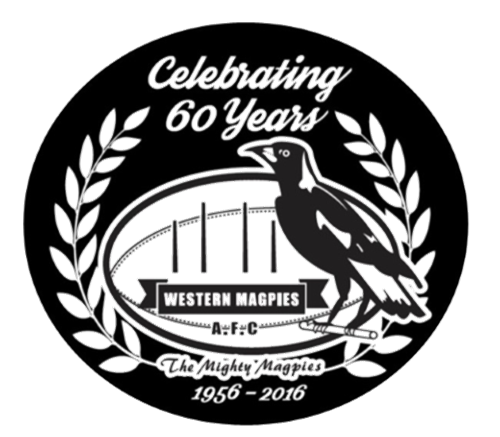 The celebratory evening will be a wonderful opportunity for you to reacquaint with former team mates, friends and members and to trace the history of the club, the glory of victory, the sorrow of defeat and all that has happened in between, which has contributed to the making of such a wonderful sporting organisation - The Sherwood Football Club. Please purchase tickets on or before 17th June 2016 to confirm your reservation because tickets are limited to only 200. Cost: Tickets $85: Canapes (Main Meal and Desert - alternate drop), entertainment. Refunds: If, after booking you are unable to attend, you are welcome to nominate someone else to attend in your place. Cancellations less than 8 days: No refund. Cancellations less than 14 days: 80% refund (less booking fee).